With the ThetaProbe Soil Moisture Sensor it's easy to make reliable, accurate soil moisture measurements. 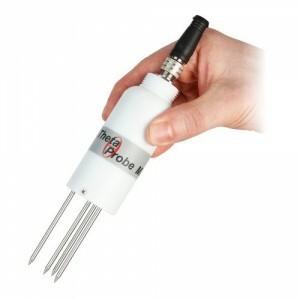 Simply insert the soil moisture probe into the soil, connect to your data logger or readout unit, provide 5-15V DC at 20mA, and within seconds you can be logging soil moisture. ThetaProbe Soil Moisture Sensors are robust, buriable and maintenance free. They can be easily installed at depth in the soil by inserting them into augered holes using the optional extension tubes. The addition of a thermistor sensor enables the simultaneous logging of soil temperature with soil moisture. A new cabling system makes it simple to extend or replace cables. With a choice of 1m, 5m, 10m and 25m extensions, flexible configurations are now possible. The ML3's salinity response has also been improved - its output has been characterised at EC values up to 2000 mS.m-1. The temperature range has also been improved - allowing operation at temperatures as low as -40 degrees C (non-flexing cables). Sensors can be purchased individually for integration into datalogging systems, or used as part of a portable kit. 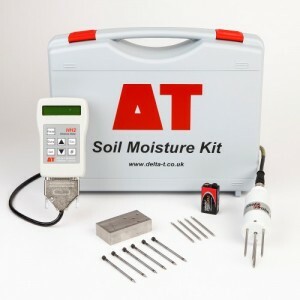 The portable kit contains all the items needed to make rapid spot readings of soil moisture content with a ThetaProbe. 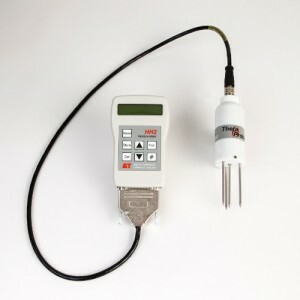 The ThetaKit includes an HH2 Soil Moisture Meter readout unit, spare ThetaProbe rods, insertion kit and carrying case.